Times have been hard for some people for the past couple of years. One of our favourite things here at The Flower Pot is to find neat DIY projects that are fun and could save you money. Of course, if there are flowers in the creative process, we like it even better! This summer the bugs have been biting incessantly so we found you a lovely DIY beeswax bug repellant candle project. The environment is on everyone's mind nowadays and it's important to monitor our carbon footprint. Beeswax is a renewable source of energy and has a high burning temperature and therefore burns more slowly. In using beeswax instead of spray bug repellant you're doing your share to protect the flowers and plants in the world. Make this a recurring project: get cheap bowls, measuring cups, and pots from Dollarama. Using separate tools will also help to make cleanup less of an issue. While the environment is up there in our list of worries, our own health is too. It's hard to know what exactly goes into your food, or any of the products you use for that matter. Organic products are also much more expensive than normal ones. There's no way to win! Or is there? The Flower Pot has found various DIY soap recipes. This one shows the different processes by which you can make soap. This way you can chose the one that suits you best. 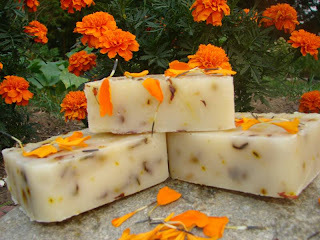 We told you we think it's best when there are flowers in the creative process: this page talks about the Calendula flower or Pot Marigold which apparently is the only flower that keeps its colour through the soap making process. Marigolds aren't ideal for pretty bouquets or vases like the ones we offer, but according to herbwisdom.com it has many medicinal uses which would make it a good addition to any soap. Traditionally, it has been used to treat conjunctivitis, blepharitis, eczema, gastritis, minor burns including sunburns, warts, and minor injuries such as sprains and wounds. Apparently, Calendula contains chemicals, which have been shown in animal studies to speed up wound-healing by several actions that include increasing blood flow to the affected area and promoting the production of collagen proteins. Calendula also possesses anti-septic and anti-inflammatory effects due to its flavonoid content. Why not kill two bugs with the same stone? Just like the citronella in the candles, marigolds are great for repelling insects. 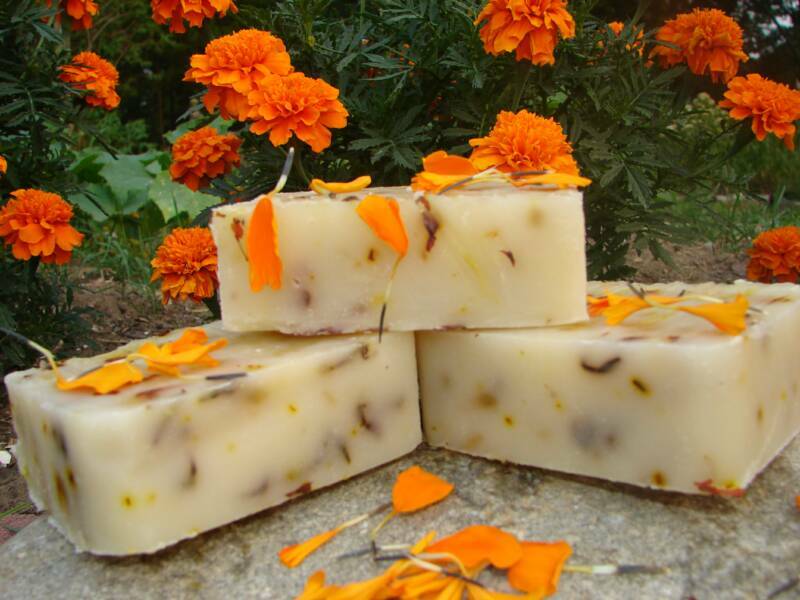 Add some citronella essential oil to your marigold soap to give it extra mosquito repelling power for those hot summer nights! We don't have to tell you that any one of these DIY projects would make an excellent gift. But if you're out of time, The Flower Pot can definitely help you out! Come by your friendly Montreal Florist store located in Griffintown, visit our website, or call us 514-938-1234 for some awesome gift ideas.